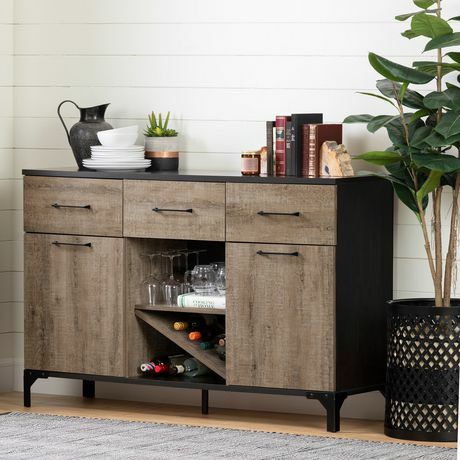 This bar cabinet is just the thing for your dining room or living room – you’ll have your wine or liquor bottles within easy reach when you have friends over for an evening. The open space can be used to hold your bottles securely. If you’re really into wine, there’s more storage space behind the doors. The top surface of this piece is ideal for making your favorite drinks! An open space for your bottles, two doors to keep glasses and small plates out of sight, and three handy drawers for your mixology tools. There’s a place for everything, with all the storage you need. 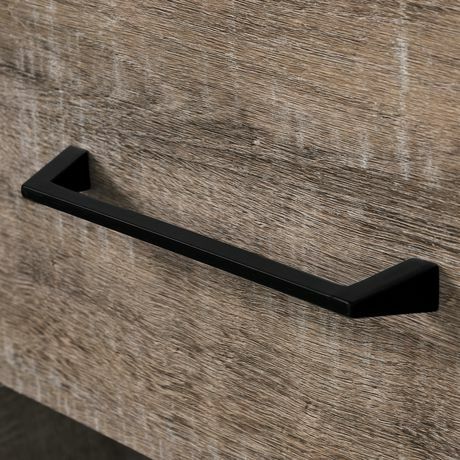 What could be trendier than an Industrial style bar – a blend of metal and wood? The metal accents give the piece character, and it’s sure to get noticed when you add it to your decor! South Shore is proud to stand behind this buffet with wine storage with an exclusive 5-year limited guarantee. Shop with confidence knowing your purchase is always covered. All our products meets or exceeds North American safety standards and our packaging are tested and certified to reduce the risk of damage during shipment. This item is shipped in 1 box, make sure to have a friend with you. 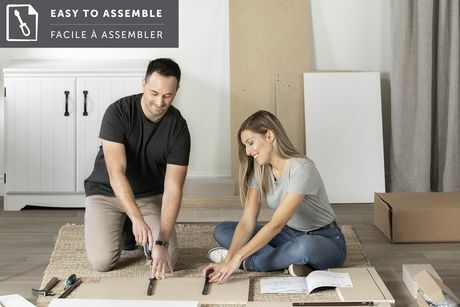 Assembly is required by 2 adults and tools are not included. If you have questions regarding this product or need assistance do not hesitate to contact South Shore Furniture 7 days support. This product is made in North America with laminated particleboard. Accessories not included. 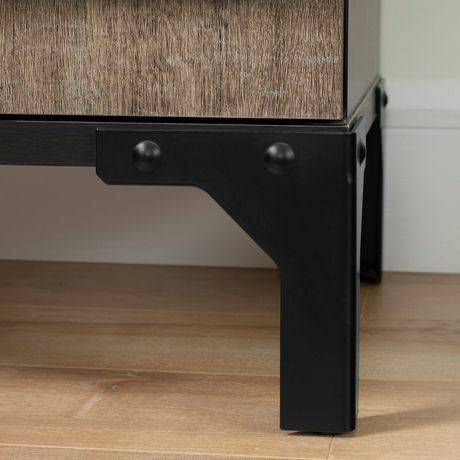 INDUSTRIAL STYLE: Metal and wood give this piece an almost “raw,” untreated appearance – a blend of finishes that makes for a very Industrial look! 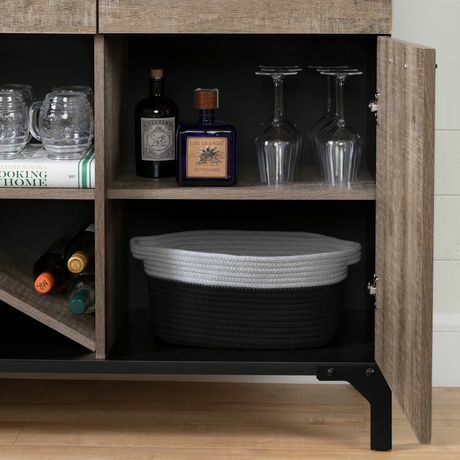 WINE STORAGE: This cabinet is deep enough to hold your wine bottles. Change the height of the shelf, and you can also fit in some liquor bottles. 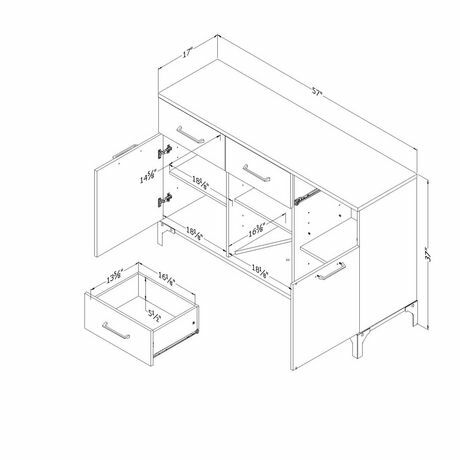 SPACE FOR DISHES AND GLASSWARE: A storage compartment with doors and adjustable shelves that can hold up to 25 lbs. each. The perfect place for wine glasses, good china, and place mats. 5-YEAR LIMITED GUARANTEE: South Shore is proud to stand behind this buffet with wine storage with an exclusive 5-year limited guarantee. Shop with confidence knowing your purchase is always covered.